Ugly Christmas sweater season is in full swing, and if you are bored of the scratchy thrift store one you picked up five years ago for $1.49, one company has the perfect sweater to blow your holiday budget. Tipsy Elves, the e-commerce site that has a variety of choices to best fit your Christmas sweater personality, just created a $30,000 sweater. Why does this festive shirt have such a high price tag? It's made with 24,274 "individually placed" Swarovski crystals. It also took 52 hours to create. 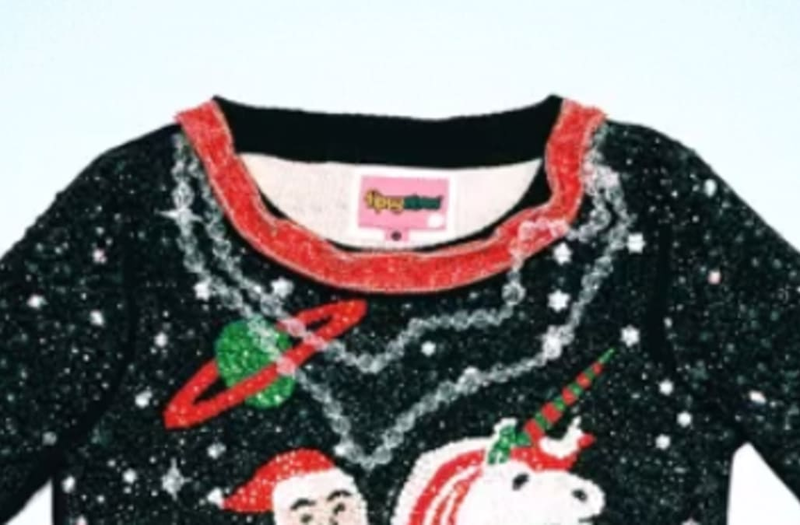 This Christmas sweater is the world's most expensive ugly Christmas sweater with Santa riding a unicorn. Sleighs are so passé. This iconic piece is considered a collector's item and will be shipped to the buyer in a luxury box. "When it comes to holiday parties, I try to keep things as stress-free as possible, so that we can all enjoy the festivities. My mom always taught me that it’s about being together, laughing, and making great memories, not on what china you used or whether a proper invitation was sent. -- Lexi, Glitter, Inc.
"One of my favorite easy entertaining hacks: disposable tableware. My current favorite and go-to for entertaining this holiday season is Chinet® Cut Crystal® tableware. From cups to glasses, plates, and utensils, all of it is disposable, but still beautiful." -- Lexi, Glitter, Inc.
"The Cut Crystal® line makes cleanup easy so you can spend more time with the ones you love. The clear design of the line just makes it so that it matches no matter what your party theme is." -- Lexi, Glitter, Inc. So when you have your ugly christmas sweater party just carry around your framed sweater instead of wearing it. That makes so much sense. Some "reviewers" made jokes in the comments, saying things like, "Can someone from Tipsy Elves confirm the size of the shipping box this sweater comes in? I will need to live inside the box if I buy this sweater." Well, at least you'll look super festive in your new home.